As I was getting ready this morning I had this thought pop into my mind: what drives you to spend hours in the bathroom getting ready, hours shopping for new clothes, hours working out and so much money on all of it that you have no idea how much you have truly spent in your lifetime? I've found that when this deep of a question comes up with me it is usually God asking me to dig deeper into a topic that needs some light shed on it. As you know this really is the age old question, why do we women have such a need to feel beautiful? One of the first answers God gave me was to look at Adam and Eve. When Adam first saw Eve he was amazed and enthralled by her beauty. He loved the way she looked and I am willing to bet Eve had no make-up on, no curling irons, no fresh manicure and definitely didn't have the latest fashion statement piece of clothing. Just as satan always does he tries to turn something that God created for good and put a twist on it. I can't help but wonder if the enemy of our soul comes to us on a daily basis and says "if you would only lose 10 pounds, then you will beautiful." Or "If you get this product or that hairstyle then you will be beautiful." No matter what lies he feeds us the truth is always God's word and according to Genesis Eve was beautiful just the way she was with no modifications. This drive to feel beautiful starts an early age, as we all know. 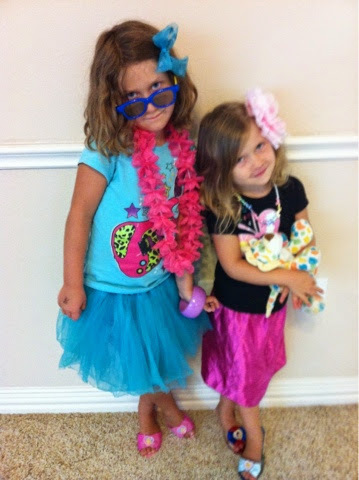 Here are my beautiful girls getting dressed up because that's what little girls love to do! God speaks to me through my kids a lot. As God laid this blog post on my heart I asked my 7 year old, Ellie, what make her feel beautiful. Fully expecting to hear something like "when I'm dressed as a princess" her answer shocked me. She responded "when I make cards for people". Wow, I think my 7 year old gets what it means to be truly beautiful. After all my years of searching for the perfect hair product and awesome new shoes I have also found that to be connected to the heart beat of God and do his work makes you feel beautiful on the inside in ways that we could never achieve on the outside. Am I saying we all need to ditch the make-up and quit taking care of ourselves? Not at all. But I am personally challenged to start seeking the kind of beauty that comes from within with more time, money and energy than I used to spend on my outward appearance. Remember that God made you perfect just the way you are. He does not make mistakes. Ask Him to show you where you have believed a lie about your beauty and allow Him to restore that area in a way that only He can. Your 7 year old is way smarter than I am. I love the way she thinks. I love the scripture you added. I want to be known as a God-fearing woman, not someone who always looked good. Your 7 year old is wise beyond her years and her mama is obviously doing a terrific job raising her!